“These are the sprouting directions I received from longtime Shiloh Farms customers, Bill and Gini Woodworth of Michigan. Every few months, Bill calls in to place an order, which always includes a few pouches of the Shiloh Farms Organic Mung Beans. Now, before I started working at Shiloh Farms, I hadn’t really heard about Mung Beans (apart from Chinese dessert menus) and didn’t know much about them. While I’ve since done a little research, I am still interested in how our customers use them and, on his last order, I asked Bill about what he does with his mung beans. He and his wife, Gini, gave me very detailed instructions for sprouting them. They said it was easy, and really, it didn’t sound hard – but who has time to do this? I was intrigued. I took home a sample packet of mung beans, borrowed one of my mom’s old mason jars she had used for canning, and put cheesecloth on my shopping list. It took me a couple of weeks to get my act together and make the special trip to the local dry good store for cheesecloth, but I finally had everything I need to start sprouting the mung beans. 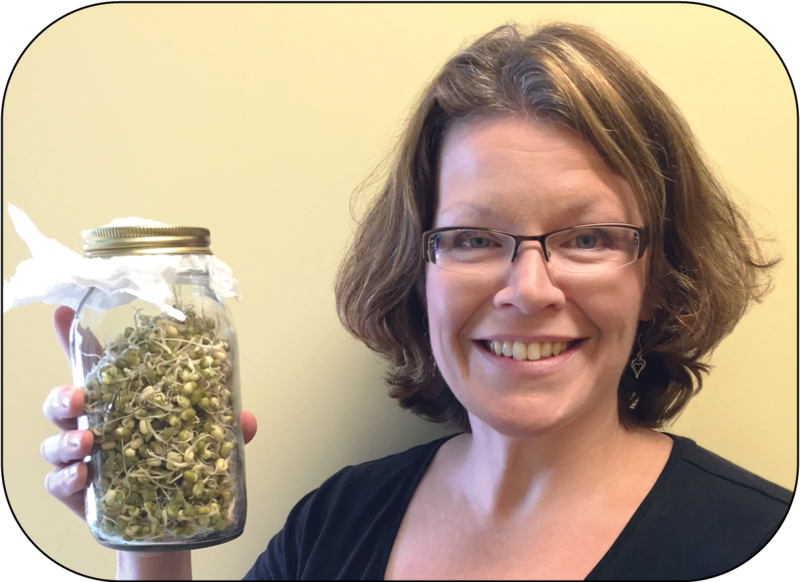 I started the sprouting process and it really was as easy as Bill and Gini had promised – in no time at all, I had a jar full of sprouts! I was very impressed with myself, but now what? What do I do with these fantastic little sprouts? I added them to my salad of fresh greens and they were yummy! I think they would be a tasty addition to a sandwich as well, and I would like to try making them into a veggie burger or some kind of stir fry. Gini also told me that if I couldn’t eat them all right away, they freeze really well. Sort and rinse the mung beans. Bill recommended starting with ¼ cup of mung beans. Soak the beans overnight. Place the beans in the mason jar with just enough water to cover them. Cover the opening of the jar with cheesecloth, and screw the jar ring on to secure. In the morning, pour the water out the jar. Do not remove the cheesecloth – pour the water off through it. Extra Tip: Don’t get rid of the soaking water! Since it contains all the nutrients from the mung beans, Gini will use the soaking water to water her house plants! Rinse the beans. Through the cheesecloth, add fresh water to the beans. Give them a gentle swirl and then pour the water off again. Store in a dark cupboard to start sprouting! Gini advised laying the jar on its side to give the beans a little more room to sprout, which is a great idea! My jar filled up with little sprouts quickly; this is a good way to let the sprouts have room to grow! The next day, repeat steps 4-5. By Day 3, you should have little sprouts growing! Keep repeating steps 4-5 until the sprouts reach the desired length. Bill doesn’t let his sprouts grow longer than an inch. Storage: Make sure the sprouts are completely dry before storing in an airtight container. They should keep in the refrigerator for up to a week. Gini also added that if she doesn’t think she will eat all the sprouts in one week, she will store them in the freezer until she is ready to use them. Have a tip or technique you would like to share with us? Contact Beth at (800) 362-6832 or info@shilohfarms.com!